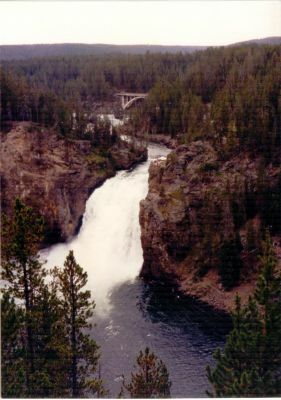 The height of the Upper Falls is 109 feet. This falls was called the "upper falls" for the first time by members of the 1869 Folsom party who estimated its height at 115 feet. "Mr. Hedges and I made our way down to this table rock, where we sat for a long time. As from this spot we looked up at the descending waters, we insensibly felt that the slightest protrusion in them would hurl us backwards into the gulf below. A thousand arrows of foam, apparently aimed at us, leaped from the verge, and passed rapidly down the sheet. But as the view grew upon us, and we comprehended the power, majesty and beauty of the scene, we became insensible to the danger and gave ourselves up to the full enjoyment of it."